Western Union President, Odilon Almeida, has revealed that the platform might adopt Cryptocurrencies. In an interview with Reuters Plus, the Company Chief hinted that the bank is interested in Cryptocurrencies as a strategy of offering their clients the ability to exchange Digital Assets for fiat money. Almeida revealed that the American based financial services network has been investigating the suitability and compatibility of Cryptos. It has now come to a conclusion that adoption is key to the future of not only Western Union but the entire financial services industry as well. Additionally, plans are underway to introduce Blockchain technology as a strategy for improving service delivery on the network. Almeida hinted that the ground is being laid to facilitate this transition that will be phenomenon and revolutionary. According to Odilon Almeida, the exploration that the company has been undertaking delves in the issue of mainstream adoption of Cryptocurrencies. This essence of this aspect is that Western Union views the global adoption of Cryptocurrencies as ratification by the world and hence an imperative impetus for offering them to their clients. Following the introduction of the first Cryptocurrency, Bitcoin (BTC) in the wake of the 2008 financial crisis, Digital Assets have been becoming popular by the day. 10 years down the line, governments, global institutions such as JP Morgan, and billionaire investors are all interested in Cryptocurrencies. Further, more individuals are becoming aware of Cryptocurrencies and many are participating in Crypto exchange trading. Mainstream Adoption, When Will It Occur? The limitations that have been hindering the mainstreaming of Cryptocurrencies include compliance, governance, and volatility. However, there is much progress being made especially when looking at the industry transformation that is taking place in 2018. For instance, most governments have regulatory agencies such as the US SEC, Japan’s FSA, India’s Reserve Bank, etc. that are working round the clock to streamline Cryptocurrency transactions. Secondly, the entry of Stablecoins such as Tether (USDT) into the scene is creating stability for risk-averse investors. Therefore, given this progress, mainstream adoption is in the offing. It is important to note that the implication for the current bear market is that it offers buying opportunities, the single most significant driving factor in mass adoption. Although it is difficult to predict the expected timeframe with certainty, it is evident that all pointers show that there is an increase and Western Union will most certainly offer Cryptocurrencies to its users. Recently, Western union tested a prototype of a Blockchain platform that was powered by Ripple. Hikmet Ersek, the Company CEO, however, could not prove cost savings and Ripple integration with Western Union was delayed. However, the model trial of using only ten transactions has been heavily criticized as the reason as to why the results leading to the abandonment were not so impressive. Nonetheless, Blockchain technology remains as the ideal option for its cross-border payment system. Unconfirmed reports indicate that Western Union is still testing Ripple and devising mechanisms for efficiency. 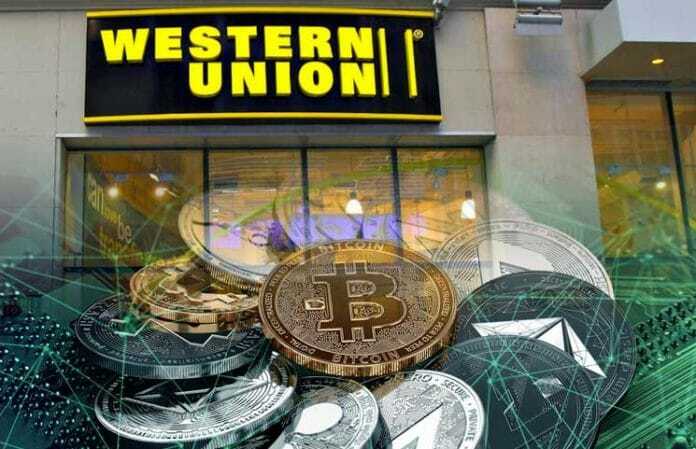 Therefore, Western Union will soon join the rank of Blockchain-based and Cryptocurrency-offering financial platforms.